Investors often have a poor understanding of volatility in low float stocks. Increased volatility leads to increased risk as well as opportunity. Level 2 charts for DRYS, SENEB and FTFT provide some low float volatility insight. Volatility is one of those things which for many retail investors means very little, but it's the basis on which stocks and are traded and the sentiment in markets is also assessed. High volatility can make entering or an exiting a stock expensive, it can also exacerbate price increases and potentially profits to the upside and downside. 1. A statistical measure of the dispersion of returns for a given security or market index. Volatility can either be measured by using the standard deviation or variance between returns from that same security or market index. Commonly, the higher the volatility, the riskier the security. 2. A variable in option pricing formulas showing the extent to which the return of the underlying asset will fluctuate between now and the option's expiration. Volatility, as expressed as a percentage coefficient within option-pricing formulas, arises from daily trading activities. How volatility is measured will affect the value of the coefficient used. This is one of a two part article discussing volatility. This article discusses stock volatility, and the other, index and hedging volatility. For many investors, stock volatility is assumed to be the charted peaks and troughs of stocks as they swing up and down in wave formation, and nothing more; but for traders who specialize in 'momentum', the increased risk which arrives with higher volatility is of less concern than the potentially greater price fluctuations it delivers, and that can be a major attraction. Larger float stocks require much higher buying or selling interest to move the stock up and down. Volatility rises relative to the amount of outstanding stock that's available from the float. (Or outstanding shares, less the stock owned by insiders). So, if the float of any stock is especially small, trading in it can become illiquid. As the smaller volume of buyers and sellers create a wider spread between the bid and ask quote, volatility rises, and risk increases. Traders might attempt to manipulate a low volume equity with high potential, and low volume is often the normal case in the summer, with so many traders taking a holiday. Investors might buy at a higher price because a particular seller is holding out for a higher price level, only to find that the stock drops later to a more acceptable level, when market makers attempt to introduce volume. Selling can exacerbate swings to the downside as well as upside, with no relationship to company fundamentals, and maybe for no reason other than people just tried to exit their position to trade something else. Investors might buy on good news only to find that traders have been selling on the good news, and the stock drops afterwards, or the reverse, which can also be true. Volatility creates momentum but it can be a disadvantage to traders who decide to short a stock without paying attention to the size of the float and possible outcome of a change in sentiment. Trying to cover a short position when there are no sellers in a stock with a very small float, carries considerable upside risk. The reduced float can make it more difficult to buy into a stock in any volume. Larger purchases may only be filled at a higher price than the current quote, at any one time. The web site 'lowfloat.com' lists some of the stocks which have a float of under 10 million shares. Web sites like 'shortsqueeze.com' include the size of the float along with the short position, but don't concentrate specifically on 'low float' stocks. All data is dependent on filings, and since web site databases usually have automated content, there may be errors relating to company take overs and dilutions, reverse split alterations etc, but it is possible (and wise) to check data manually too and from insider filings submitted to the SEC. 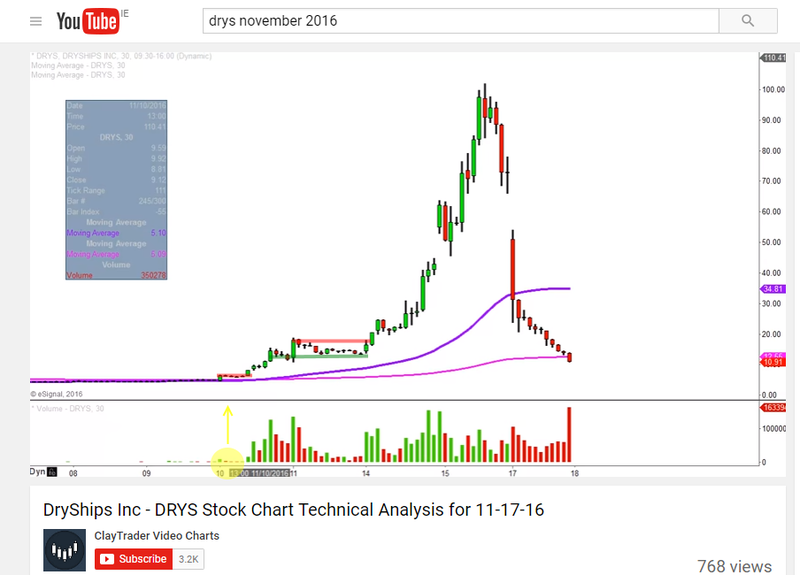 A bullish example of volatility is illustrated by Dry Ships Inc (ticker DRYS) as it was trading following an extreme split reversal in 2016. When China was returning a rate of extensive annual growth, investors in the companies which shipped goods around the globe did very well. Since the Major Recession though, the tide has turned for container shipping. Sentiment in companies like DRYS (which even last year still had an exceptionally small float), can still turn on a dime, which is exactly what happened last fall when investors speculated things would improve across the sector, and momentum traders jumped into a rising DRYS. This DRY Ships chart is in the public domain on Youtube. We can see that the comparative volume until after November 10th 2016 was extremely low. Technically, the bullish momentum started to develop after the stock broke through the red inter-day 'ceiling' on November 10th. It established and held a new high on November 11th, then corrected and held the support level established until 14th. On 14th it broke through selling resistance, established another high, and then used the previous high level as support. However what is interesting is the level of volume which achieved this increasingly high share price. The chart below is on 30 minute time intervals. Bear in mind that there's only one million shares in the float, (according to 'The Street' at that time). To achieve continuous high volume, it seems likely that traders trying to short were selling to others trying to cover etc. So the same shares were probably swapping multiple times each day. We can see that before November the stock was climbing but only slowly on low volume which hardly features in this illustration. On 10th there was a substantial increase in the share price, which corrected, but only on a shallow level, and then broke higher on volume. A scenario which developed over just a couple of days. The Street released an article at the time, referring to the fact that the end result of the reverse split last year was a float of one million shares in November. (The situation has changed dramatically since from dilution). The stock was trading at about a dollar in August 2016, and was squeezed to over $100 in very short order. The reason?, short sellers had ignored the float, and had actually shorted 1.7 million shares of a 1 million float. DryShips undertook a 1-for-4 reverse split when the stock was trading at $1 a share, then engineered a 1-for-15 reverse split at the start of November. As a result, there were just over 1 million shares of the stock in the public float, opening the door for exactly what's happened now -- a short squeeze of dramatic proportions. 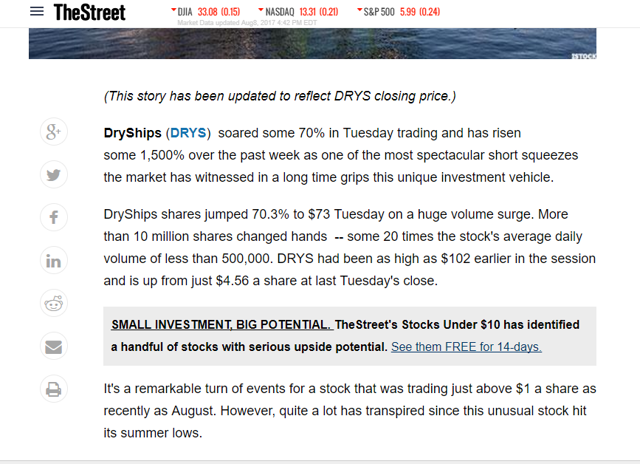 According to the website ShortSqueeze.com, 1.7 million shares of DryShips were in short sellers' hands as of October's end, up from just about 300,000 shares six months ago. That isn't to say DryShips' rally is purely a function of the short-sellers market. While it is largely that, bets on the direction of overseas-shipping pricing have expanded sharply since last week's U.S. presidential election. 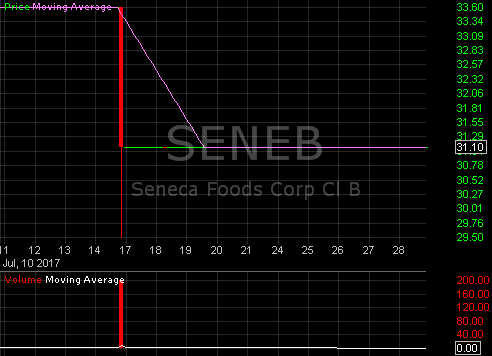 SENEB on a one minute level, shows no volatility at all, with trading at $31.10 between 10.15 am and 12.00. 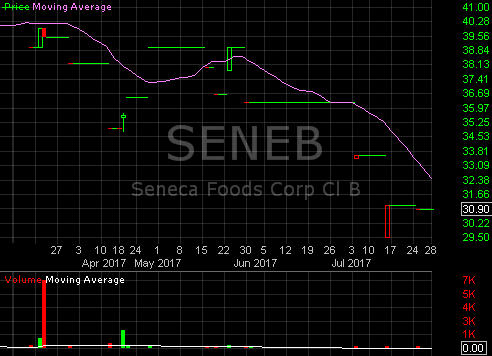 Despite generally held opinion that low volume ultimately means a lower share price, SENEB contradicts that theory entirely. Low volume is an issue for very liquid stocks. 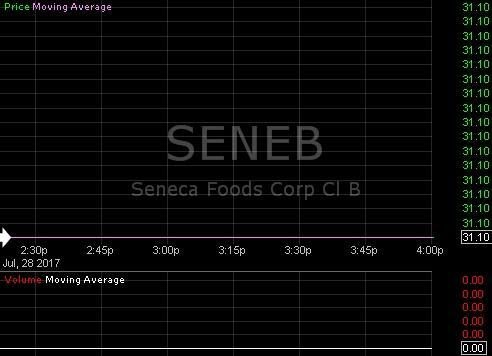 SENEB however has 6,338,500 shares in the float according to 'shortsqueeze.com'. When nobody wants to sell or buy, the stock trades flat, the share price doesn't dwindle and fall just because there's no volume, in a low float stock. The chart below on 15 minute intervals, gives a different impression entirely, but check the actual price difference, and we can see that the stock was still trading $31.10 between 25th and 28th July. 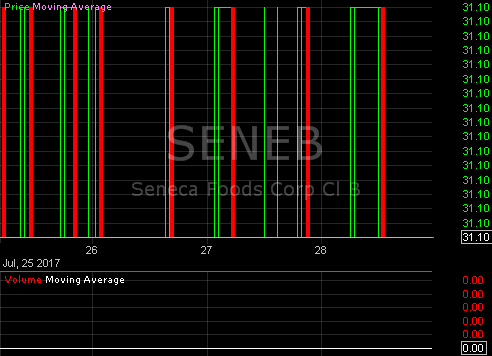 On an hourly level, we can see that on one single day, SENEB traded between $33.60 and $29.50, closing at $31.10. The red daily candlestick gives the impression of a large block of selling, but we should remember that red means a fall in price, not the reasons behind it, which could be due to somebody trying to buy low. The stock eventually closed up from the low, but didn't fully recover. On a daily level, we can see both fluctuations in the share price, and the level of volume (as provided by level2stockquote.com). On what appears to be the 16th there's a red bar, closing on a green line which indicates sideways/flat trading. According to the volume bars underneath, red volume is all that developed in any scale following the 16th, but it had minimal effect on the share price, compared to the 16th. In March there was a significant red candle volume, following up a small green one which created a rise in the share price. Yet compare this candlestick and the fall in share price, with that of 16th July. There's no comparison. Maybe volume is missing from the equation somehow, but the effect of small selling volume in July appears extreme compared to the much greater volume in March, which suggests the long red daily candlestick in March actually consisted of buying rather than selling volume. We would have to have access to book records at the time to see the trades that actually went through then. 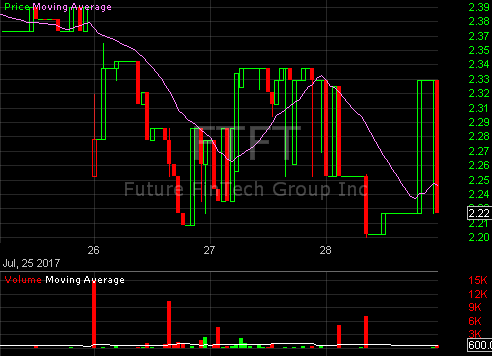 FTFT (formerly SPU), is another stock with a very low float. 5 million shares are outstanding but filings indicate that insiders hold the vast majority of those shares, probably from China, and possibly only around 550 thousand available to retail/institutions in the US. The current short position in FTFT is a highly risky 340 thousand shares, according to shortsqueeze.com. The 1 minute chart below illustrates volatility, with a bid/ask spread fluctuating between $2.22 and $2.33 between 2.30 and 4.00 pm July 28th, and again with low volume. 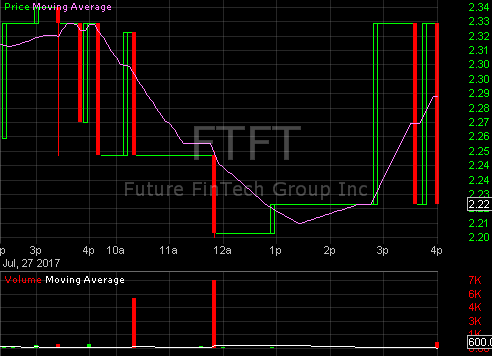 The 5 minute chart below illustrates upside volatility. Check the very low volume bars highlighted in green at the bottom, and the impact on the share price. Around 700 shares was traded at 4pm July 26th, which moved the share price up from $2.27 to to $2.33. Either the subsequent trade which took the price down is too insignificant to appear, the price fell back to meet a low priced bid, or the price spiked to meet a higher placed sell order (as a little after 10am the share price spiked to about $2.32 from about $2.25, and then fell back again). That fall according to the volume indicated here was over 5000 shares, so there's a good chance the stock actually bounced up in price to meet a higher ask. The following green volume bars were too small to have any impact on the share price, which fell once again as an additional 7000 shares sold appears on this chart, creating the $2.20 low. 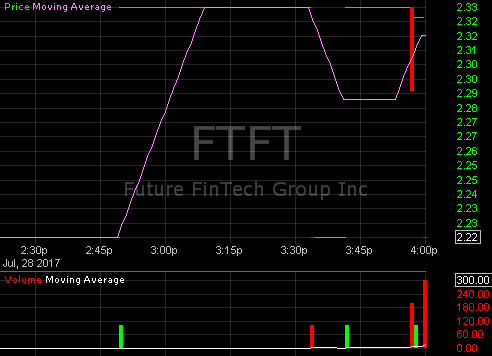 However check the green volume bars following this trade. From about 11.50 am and 3.00 pm, there appears to be minimal volume, and only small green bars; but the share price recovered to $2.33. Then from about 3.40 pm to 4.00 pm trading fluctuated between $2.22 and $2.33. This appears to be the difference between the bid and ask spread, with the share price climbing to meet higher level selling. Although 'level2stockquote.com' may be missing some quotes, generally, low selling volume coupled with a wide spread is an early indicator of rising prices. It means the market is forced to rise to meet sellers. The 15 minute chart shows large blocks of red volume. However over a period of 15 minutes these 15 minute blocks can be composed of both buying and selling volume. If the market has fallen to meet a lower priced bid, the volume will appear red if it's closed the prior 15 minute interval at a lower price, (not because of the reasons behind it). What we can see on the 26th July, is a fall down to $2.21, which appears as 'red volume', followed by a very much lower volume recovery, mostly in green blocks on the 27th, illustrating rising prices. On 28th the share price fell, illustrated red (as the share price closed down). However from $2.20 it recovered to $2.33 on what appears to be no volume. This suggests this must either be the difference between the bid and ask spread, (or missing quotes from 'level2stockcharts.com') over that same time frame. The weekly chart illustrates the accumulated volume situation well. It's clearly impossible for a stock with 5 million shares outstanding to trade with a 30 million volume over the course of a week unless traders are continually buying and selling to each other. 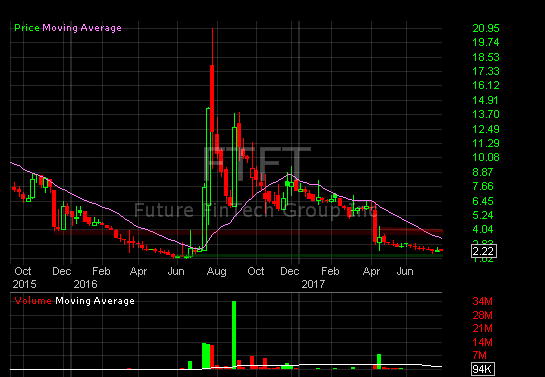 In June FTFT bounced on a bullish green candlestick with 7 million weekly volume, comparable to but higher than the green break out volume of June 2016. Unfortunately there was no follow through. Traders looking for continuously high volume from a stock which is being accumulated (and has only about 550 thousand shares available for ownership anyway), were obviously disappointed in June's low volume summer trading. There are many small float stocks which create unusual trading conditions and extreme volatility (or price moves) in unexpected situations. As we can see from the DRYS situation, the stock moved rapidly in less than a week, a situation that wasn't considered possible the previous August when it was trading between $1.00 and $2.00. Obviously short traders carried huge risk last fall, which they didn't fully appreciate until it was too late. Short covering in DRYS probably only accounted for a percentage of the over all volume last November. People eager to buy shares would also have been buying stock, and shares sold by traders intending to 'short' from higher levels, but who were then forced to cover at still higher price levels. Both stocks (and investors) suffering from a complete misunderstanding of what constitutes volume, and volatility from a very low float. Volatility and float size are issues all investors in small companies should be aware if not wary of. Disclosure: I am/we are long FTFT. I wrote this article myself, and it expresses my own opinions. I am not receiving compensation for it (other than from Seeking Alpha). I have no business relationship with any company whose stock is mentioned in this article.